also artifacts can be spelled as artefacts. artifacts are different from artefacts. the first aid tent has only 3 shots so thats why you and your opponents first aid tent stoped healing (the ammo cart doesnt help this). If you want to trade some resources at the markerplace, say 30 surplus sulfur, you can't type in the amount of rescource you want to trade a away, only the amount of gold or move the slider bar. imo it woudl be very handy if you could just type in the amount you want to get rid of. The game(HEROES 5) was playing fine the first day i installed it but after that,without having installed anything at all ,the screen flinks 3-4 times and then i get this stupid message: error failed to set display mode!!!!!! i've tried everything!! help someone!!!! i have a geforce fx 5900xt and i did installed the directx9.c as well as the 1.01 patch but it kepps doing that!!!!!!!!!!!!!!!! Help!!!!!!!!!!!!!! In the Dungeon campaign, mission 3, the southwest corner of the map has a garrison. In the garrison you will fight Death Knights, but they have a Peasant profile picture in the initiative bar. Very funny, but it is a bug. Also, in the Dungeon campaign, mission 2, the first messenger to escape caused an immediate CTD. I haven't experienced any CTD's, except for this one. Tooltips are also slow to appear, and sometimes never do unless I move my cursor one more time, after the intial move to initiate a tooltip. In other words, if I see something I want to bring up a tooltip for, I slide the cursor onto it, and it won't come up. I then have to slightly move the mouse cursor again, and it will finally pop up. This may be due to the fact that I have a 1.4GHZ computer, and the requirements state a 1.5 GHZ. In other words, my computer might not be completely up to par with running the game as it should, and if it's not then that's my fault, not the game's. Although, I do meet all the other required specs, the 100mhz difference is the only thing which my computer lacks. All in all, a great game, though, if a little hard for this Heroes veteran. I can tell that I was rusty. Best Heroes of M&M, yet, I believe. If not eveything on your system is reccomended, something gets crapped up. The wraith is reserved?!?! NOOOO I'M NOT GOING TO BE PINK AND UNDEAD! Major error! In a prison I found vladimir, but he had his ultimate ability without it's prerequesuts. 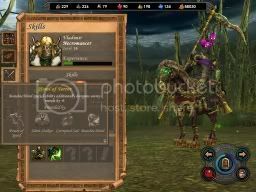 in necro campaign, the last level, I have Markal to kill Godric with his academy forces. When I set auto combat mode, I win. But when I try to play it manual, after the whole academy army of Godric is destroyed, smt happens, that is 50 angels, 100 priests, 300 footmans and 400 archers suddenly appear in the battle, which kill me instantly. I experienced this same issue and thought it was bizarre! Does Godric have some special ability I'm not aware of to account for this? No thats intentional that he gets those reinforcements. It is not his special just an event set there as those haven troops are like taking his side or something, thats also why Isabel's troops keep defecting in that mission. Though that was rather mild army, when I did that mission last he got like... 76 angels, 40 paladins, 340 archers, and 826 footmen. I beated him up still. Edited by Maurice at 10:33, 17 Jul 2006. Heroes rescued from prisons may be arbitrarily designed, for what skills they have. It's just the way they set him up, I've seen it with more rescued Heroes. Not a bug. - When you play Hot-Seat and you have auto-saves on, it will save the game as long as Player 1 (red) is active. Once Player 1 leaves the game for whatever reason, corresponding turns no longer see the auto-save kick in. Seems that the auto-save feature is tied to Player 1, as opposed to the start of the turns. Silly bug, if you'd ask me. -- When a ranged unit shoots at Cavaliers or Paladins, the projectile (arrow, bullet) seems to hit the front hooves of the horse, rather than the rider of the animal. Seems strange, makes it almost look as if the volley misses its target. -- View angle for Titans is messed up, if their target is too far away; the camera doesn't rotate fast enough, so if the target is on the other side of the battlefield, it remains out of view until the very end of the combat moment. -- View angle at times sticks too long on Archmages, facing them while casting a Fireball, causing you to miss the actual explosion (happens somewhere behind the camera). View only returns to normal after the blast occured. AI controlled melee units seem to go into "Defense" mode sometimes as long as "free" allied shooters remain, even when there are hostile melee units nearby, attacking allied units. This even happens when those melee units being put into "Defense" have no retaliation (like Vampires). Sometimes, AI decisions seem ... odd, especially with casters. The AI sometimes prefers to bless an ally stack or curse an enemy stack, where dishing out damage with that caster stack instead is much more profitable (especially when the enemy is nearly routed). The town of "Talonguard" (Haven town) has no specialty. Its Biography says "undefined". It seems the AI is the only H4 feature they included in the game. Found two more (although they're pretty much identical). This happens in Hot-seat mode, but may also happen in other multiplayer modes. - If player 6 (teal) is Sylvan, his symbol will instead show as the Haven symbol (this counts for towns as well as anything else flagged by this player). The color is correct, teal. - If player 8 (brown) is Academy, his symbol will instead show as the Sylvan symbol (this counts for towns as well as anything else flagged by this player). The color is white/grey, which I think is the neutral color. It's because he is standing out of the town, in the visiting slot, and there is more army in the town itself. No, this is a scripted event. Then what happened to the army in the town? Godric is standing in the "visiting" slot of the Academy town (Hikm, to be exact), with most of the forces in the town's garrison. When the city is attacked, the game merges the visiting forces with the garrisoned forces (it always does so) and uses those to defend the city. In this case, you have to defeat Godric's Academy forces. Once you killed the very last one of them, as a scripted event he will suddenly receive a bunch of reinforcement troops in the form of Haven creatures. Edited by Miru at 20:57, 18 Jul 2006. He has haven troops outside of battle, and acadmy troops in the town. When you fight him, you fight the Academy troops, then the haven troops appear. I think the haven troops depend on what units have fled to his side so far. Edited by superfly86 at 14:51, 01 Aug 2006. 1) You can't connect to games a lot of time in Duel mode for multiplayer on Ubi.com. Usually 1/2 the games will produce an error saying 'The host has cancelled the game.' or something to that effect. 2) If someone resists the Chilling Bones ability when they are attacking you, the font used is weird. It's normal and white unlike all the other text. I dont know how to beat the level now, and I have no intention of restarting it. Based on my earlier post about town boni, as I determined them ingame by trial and error in patch v1.2 (can be found here), there are several bugs compared with the manual as it has been recently released.